Making the switch from a manual to an electric toothbrush might seem costly, unnecessary and possibly a complete waste of time. You may have seen and read how an electric toothbrush can offer up to 100% more plaque removal and provide a better clean, but until you experience it for yourself, you will not know. There are many products you can’t take back to the shops once you have used them and oral healthcare products tend to come under this ruling because of the association with hygiene. Thankfully Oral-B have acknowledged this and offer a 30 day money back guarantee. Called ‘Oral-B Power Test Drive’ you have 30 days to try out an electric toothbrush and if for any reason at the end of the 30 days you are not satisfied, you can get your money back. To our knowledge this 30 day money back guarantee applies to all Pro series and TriZone series electric toothbrushes currently on sale. You simply need to keep all the original packaging and the original receipt to be able to get your money back. Try Oral-B Professional Care starting from the day of purchase. If you are not satisfied with this product, please return your handle, refills and charging unit in their original box with your original cash register receipt to the address below within 30 days of purchase. This does not affect your statutory rights. Terms and conditions apply, for further details, please contact our customer service. 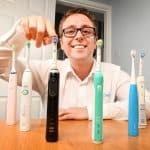 This whole process essentially allows you to try an electric toothbrush for free, with no commitment, if you are not happy return it and Oral-B will arrange a refund for you. Once the brush is sent back the refund is handled by Oral-B. Well to be precise, Procter & Gamble (P&G) the parent company of Oral-B actually outsource this to another company. On receipt of the brush and all the contents, providing it is within 30 days you will be sent a cheque in the post for the amount you paid. The details on and in the box are not particularly comprehensive or clear on what you must do so let us summarise it in the following bullet points. When you purchase the Oral-B Pro or TriZone series toothbrush, keep the original receipt and all original packaging. Use the brush for just under 30 days (this includes weekends). Your covering letter will need your name and address on it so a cheque can be generated. You must pay the cost of postage for sending the brush back to Oral-B. The brush must be received by Oral-B WITHIN 30 days of purchase. For example, if you purchase it on the 1st, you will likely want to send it on or around the 25th of the month to allow time for it to be delivered before the 30 days pass. Once received, a cheque will be posted to you for the cost of the electric toothbrush. We certainly like the idea of the scheme. The 30 day challenge is a bit of a stretch when the brush actually has to be sent back and received within 30 days but at least the option exists, because it is not until you use the brush that you really know for sure. Up 30 days from date of purchase. It must be returned to Oral-B on or before the 30th day. You need to return all the original box contents to qualify, so do not throw any packaging away. You must include the receipt you got when the brush was purchased too. A covering note with your name and address is also required. The delivery address for other countries will be different, please consult Oral-B for this. The method you use for delivery will be up to you. We advise using Royal Mail, preferably a signed and insured for service so that you can prove delivery if required. The shipping cost is your responsibility and these costs will not be returned, only the cost of the electric toothbrush itself. Sending it via a non signed for or insured service will reduce your shipping cost but you will be unable to prove delivery or claim if lost. The refund for the toothbrush you are returning is sent to you in the form of a cheque after they have received the brush back. I too sent my toothbrush back under the agreement of the 30 day guarantee but have not heard a thing or received a refund? It is frustrating to read such a comment. Please can you check if you have received the item. We are not Oral-B or associated with the programme, we have just written about it. We have bought two Oral-B 600 along with pack of crossaction brush heads, while we think the brushes work well we find the charging time something of a joke, on the first charge up it says to charge for 22hrs but we find that even after a short amount of use the charge still takes hours i.e just used for 2 days and now on charge and is still going after 15hrs. For this reason we will be returning the brushes along with the spare heads under the 30 day money back guarantee. Hi Geoff. Sorry to hear you have not been all that impressed with the Pro 600. When you say it is still charging after 15 hours, what do you mean exactly. If the brush is on the charging stand, it will to a point always be charging. Like if you leave a mobile phone plugged in, it will continue to charge as much as it can the whole time it is connected. If you take the brush off the charging stand and use it, can you get about a weeks life from it? If not, something is likely wrong. Once left on charge overnight, if it does not then last a week, there could be a fault. Exactly my thoughts john, No a large portion do not have it, only new builds do and there are a lot more old homes, do you know why they have a socket n a bathroom? because before in the old age everything was wired and wires for shavers, trimmers etc wasnt long enough so they put them there, as the world has developed from wired to cordless you can charge it and use it anywhere so having a 2 pin where we cant use anywhere makes it worse than having a wired one. Move with the times a better solution would be to change the plug to uk specs or provide 2 options to choose from clearly marked on the box. What do I think? I think it is ridiculous to buy an electric product in the UK to find when you have got it out of the packaging, that it has a two pin plug on it. Sockets in the UK have three pin square plugs. I am already not satisfied. Whilst I completely get your frustration, there is good reason behind why they come with a 2 pin adaptor, it is all to do with safety. You would get the same from any toothbrush manufacturer selling brushes in the UK. Essentially the brush is designed to connect to the shaver sockets in bathrooms that operate at a lower voltage and with a different connector. Not all of us have these but a large proportion do.